THE LAVENDER HILL MOB is being shown on TV this evening but I won't be watching it. (If only I had received 1 [pound] each time one of the Ealing comedies was shown I would be a rich man. My contract didn't cover mechanical reproduction.) It was a good film, I think; well over forty years old now and mercifully it only lasted an hour and a half. Stanley Holloway and I got on exceedingly well and became good friends. He was always genial, easy-going and meticulously professional. 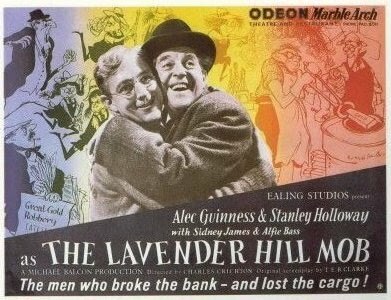 Ealing Studios never succeeded in killing me in spite of some quite good tries, the first of which was during the making of LAVENDER HILL. Rehearsing a brief scene in which Stanley and I were required to escape from the top of the Eiffel Tower, the director (Charles Crichton) said, 'Alec, there is a trap door over there - where it says Workmen Only - I'd like you to run to it, open it and start running down the spiral staircase. Stanley will follow.' So I did as asked. A very dizzying sight to the ground greeted me. But I completed half a spiral before I noticed that three feet in front of me the steps suddenly ceased - broken off. I sat down promptly where I was and cautiously started to shift myself back to the top, warning Stanley to get out of the way. 'Further down is eternity,' I called back. Stanley and I regained the panoramic view of Paris pale and shaking. No one had checked up on the staircase and no one apologized; that wasn't Ealing policy.